This year’s recipient of the Venice Biennale Golden Lion for Lifetime Achievement, El Anatsui is known worldwide for his shimmering wall hangings composed of aluminum liquor bottle caps, copper wire and other discarded materials. His artworks, which also include relief sculptures of burnt wood and constructions from metal printing plates and roofing sheets, embody a wide array of artistic techniques, aesthetic traditions and layers of cultural meaning. Dzesi II is made of liquor bottle caps, which recall the alcohol brought by Europeans to trade for slaves and other commodities. They also speak to the high consumption of alcohol in the artist’s community and its social costs. To construct the work, El Anatsui and his assistants flattened the caps and joined them with wire. As in Ghanaian kente cloth, narrow strips are made and assembled to form vast patterns. 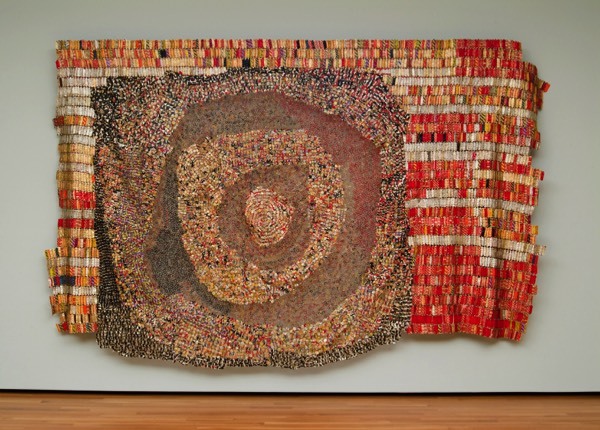 Dzesi means “sign” or “identity” in the language of Anatsui’s people, the Ewe, and the concentric circles are an Asante symbol for “king.” Because of its scale, Dzesi II also suggests American abstract painting from the 1960s and 1970s. 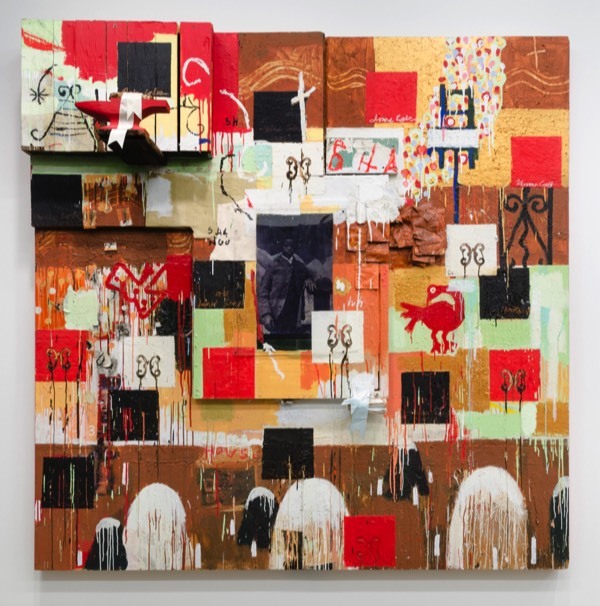 Although El Anatsui was already a leading force in African art when Dzesi II was acquired, its purchase preceded the acclaim the artist received at the 2007 Venice Biennale. The Akron Art Museum extended its support for the artist by hosting Gravity and Grace: Monumental Works by El Anatsui in 2012 to great acclaim. The exhibition’s subsequent tour to the Brooklyn Museum in New York, Des Moines Art Center, Bass Museum in Miami and the Museum of Contemporary Art, San Diego, attracted nearly 200,000 visitors. 96 x 96 x 24 in.